Robert Rosenthal, Distinguished Professor at the University of California, Riverside, received his B.A. and Ph.D. from the University of California, Los Angeles. For over 40 years, his research has centered on the role of the self-fulfilling prophecy in everyday life and in laboratory situations. He has done ground-breaking investigations on the effects of teacher’s expectations on students’ academic and physical performance, the effects of experimenters’ expectations on the results of their research, and the effects of clinicians’ expectations on their patients’ mental and physical health. He also has been a pioneer in studying the role of nonverbal communication in the mediation of interpersonal expectancy effects and in the relationship between members of small work groups and small social groups. Professor Rosenthal has also made significant contributions to the area of sources of artifact in behavioral research and in various quantitative procedures. In the realm of data analysis, his special interests are in experimental design and analysis, contrast analysis, and meta-analysis. His most recent books and articles are about these areas of data analysis and about the nature of nonverbal communication in teacher-student, doctor-patient, manager-employee, judge-jury, and psychotherapist-client interaction. He is Co-Chair of the Task Force on Statistical Inference of the American Psychological Association. Rosenthal’s research has inspired hundreds of studies. In addition, he has worked with dozens of Ph.D. students who have gone on to distinguished careers themselves. 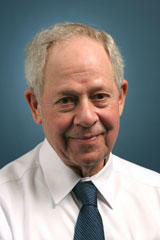 Rosenthal is the recipient of numerous awards, including the Gold Medal Award for Life Achievement in the Science of Psychology from the American Psychological Foundation, the Distinguished Scientific Award for Applications of Psychology from APA, the James McKeen Cattell Award, the SESP Distinguished Scientist Award, the AAAS Prize for Behavioral Science Research (with N. Ambady), the SPSP Donald Campbell Award, and the AAAS Socio-Psychological Prize (with K. Fode). He has also been a Fellow at the Center for Advanced Study in the Behavioral Sciences and a Senior Fulbright Scholar. * The FABBS Foundation would like to thank Dr. Robert Feldman and Dr. Peter Blanck for nominating Dr. Rosenthal for this honor and for leading the effort to spread the word about his nomination. Would you like to honor Dr. Rosenthal? It’s not too late to have your name added to the list of donors! You can make your donation to Dr. Rosenthal’s In Honor Of… campaign at anytime.